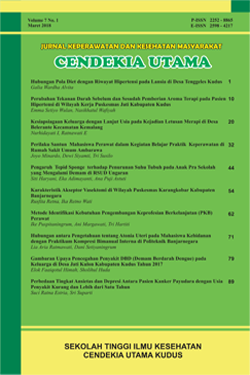 Jurnal Keperawatan dan Kesehatan Masyarakat Cendekia Utama with registered number ISSN 2252-8865 (Print) and 2598-4217 (Online) is a periodical journal conducted by a team under STIKES Cendekia Utama Kudus. This Journal established since 2012. This journal publishes research results related to the nursing and public health. The journal is continuously published twice a year on March and October. ISSN: 2252-8865 (Print) dan 2598-4217 (Online).